The Dino-Lite Premier AM4013MZTL digital handheld microscope features with longer working distance, an adjustable polarizer, enhanced 1.3MP sensor, and metallic housing providing a microscope that has high magnification at a nice working distance with the ability to reduce glare, have advanced image quality, and the ruggedness to withstand the test of time. The AM4013MZTL has high magnification at longer working distances which requires some distance to obtain a focal point. With that in mind, it has variable magnification depending of distance with a max magnification of 90x with a minimum working distance of approximately 5cm away. An example to compare it to is with an AM413MT with 200x optics, it requires you to nearly touch the object to obtain 50x or 200x. With the AM4013MZTL longer working distance optics, its maximum magnification of 90x has to be obtained at approximately 5cm away. 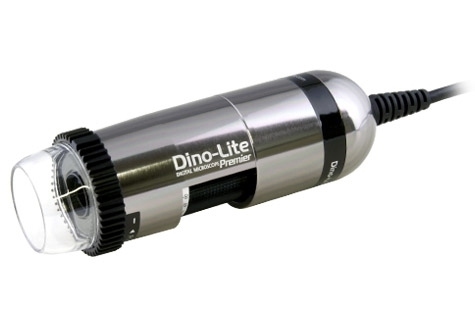 Having a Dino-Lite with longer working distance is great for applications that require a certain space between object and microscope to either work under or require a certain distance to view. With the adjustable polarizer, you can adjust the amount of glare that reflects from what you are viewing, so you can see fine details of surfaces by fully or partially removing the reflection of semi-transparent materials like; jewelry, glass, or plastic. It is also ideal for examining highly reflective materials, such as metals or solder joints. The AM4013MZTL enhanced 1.3 Megapixels sensor provides improved low light visibility, so you can view and see more detail when lighting is not perfect. The enhanced 1.3 Megapixels sensor also provides very detailed images at its max resolution of 1280x1024 so you do not mess a thing. The metallic housing of this model suits it for professional use, and has a robust feel that cannot be found from similar handheld microscopes of its kind. It provides extra protection of the microscope from the elements and retains its looks after heavy usage of the microscope. The AM4013MZTL comes with the DinoCapture 2.0 software for PC's and DinoXcope software for MAC's. It allows you to take pictures, record videos, and also annotate on images. With professional models such as this, there is also measurement and measurement calibration tools to instantly gather or share important information of what you're looking at. The Dino-Lite Premier AM4013MZTL digital handheld microscope is the perfect companion for people who require high magnification at a distance and the ability to reduce glare from highly reflective objects. And yet it can still handle some abuse with its metallic housing. Plug the USB to your computer and use the included software. The AM4013MZTL digital handheld microscope provides the ultimate digital microscope experience.